How about some eye candy? 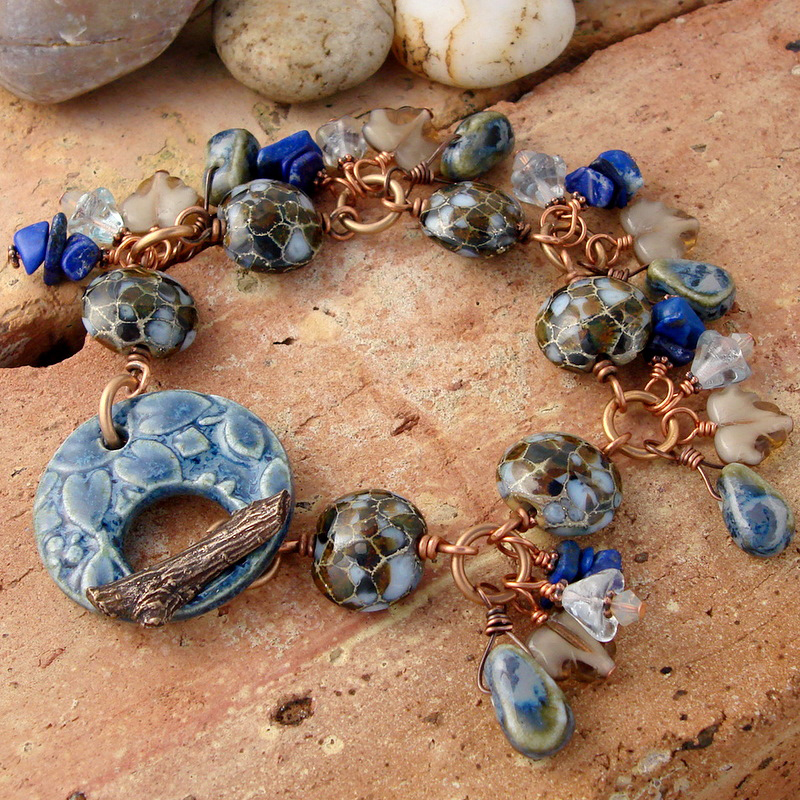 I made this piece for Raida of Havana Beads -- you can read the story about it by clicking here. 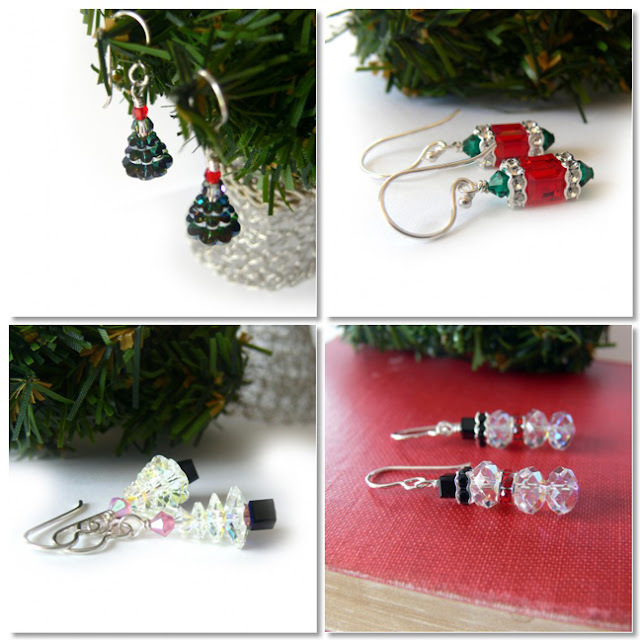 Pretty, sparkly crystal earrings for Christmas and the holidays, ready and waiting in the Holiday Section of my web site (just click here!). 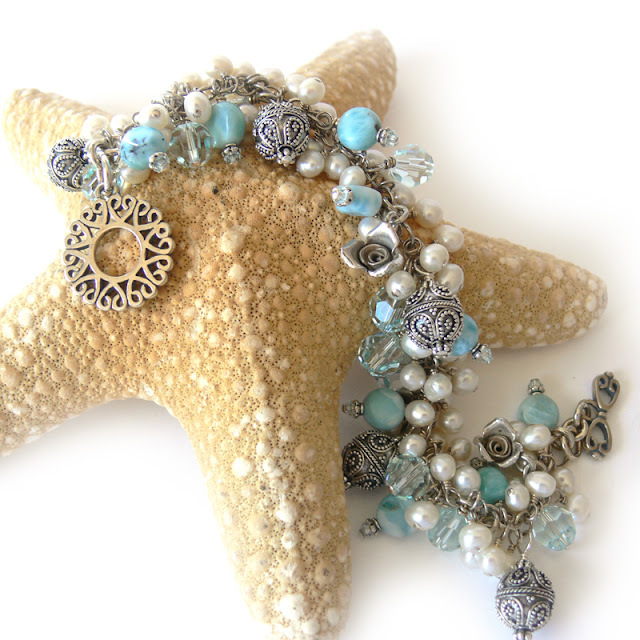 Not yet on the web site, a lush larimar, pearl, crystal, and silver charm bracelet, done in oxidized rather than bright silver for an antiqued look. Larimar is a rare gemstone, and I sell out of it quite often at my shows. It's called "Larimar Pearl Princess". This bracelet, "Sari", is also not yet on the web site. It recently won third place in Jelveh Designs Beauty Contest, which was judged by Fire Mountain Gems. It's made with Jelveh's lampwork beads, dyed potato chip-style pearls, and an AMAZING toggle clasp in sterling. 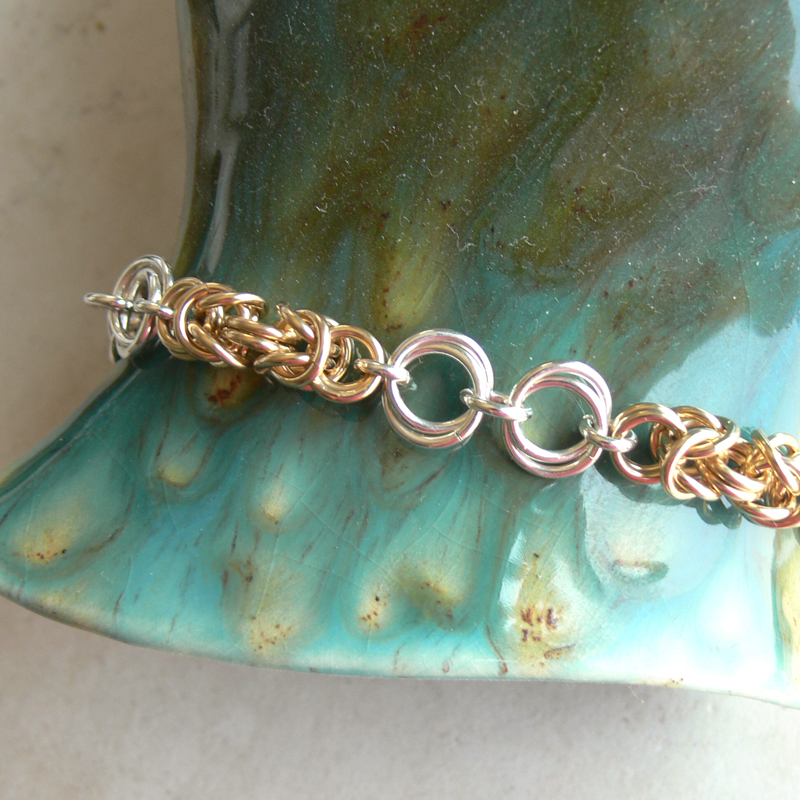 And finally, a sterling silver and gold-filled chain maille bracelet that is an instant classic and perfect for layering with other chains. It's called "Double Love". If you're interested in any of these pieces before I get them on the web site, email me! Hope you enjoyed the candy! The Christmas pieces are sooo cute! Wow - beautiful pieces. I love the bracelet with the copper - I seem to be changing over most of my wire work from silver to copper. I love it's warm look. Those are all gorgeous Lori. Wow! 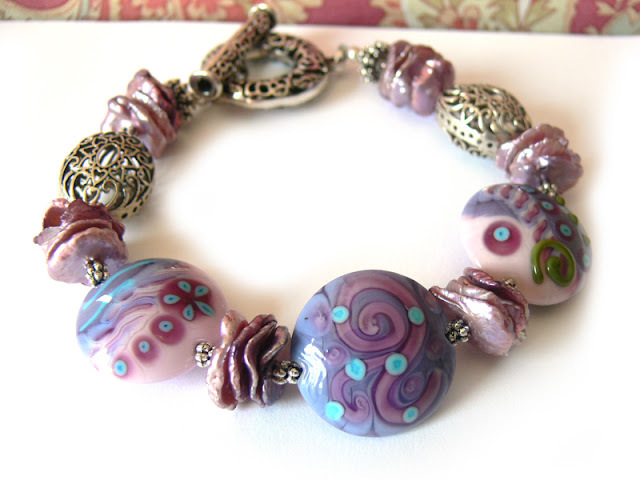 I love what you did with LeAnn's toggle it pairs so nicely with the lampwork beads. Everything looks so festive! Great pieces - and your pics are soooooo wonderful. I love how you present your jewelry. I love that Larimar bracelet especially. The one for Raida is really cool too - I read about it on her website yesterday. Beautiful as always Ms. Lori. Beautiful pieces honey...I love those darling Christmas trees! Check out my fabulous Christmas giveaway if you haven't already! Lovely! I love the bracelets esp! Ah! They're gorgeous! You have such class, Lori, and it shines through your jewelry! what gorgeous eye candy. I really love the toggles you chose to use in all three bracelets very nice. the color combo is delightful ~ you're right CANDIES for sure! Gorgeous! Like your changes in your opening page too. You definitely bring the "Pretty" into your work. It's all eye candy to me! I'm loving your work more and more. What an inspiration you are. First I like the new banner you created, then the jewelry is beautiful! Those lampworked beads by Jelveh are incredible! LOVE the colors! WOW, these are over the top beautiful Lori! everything is beautiful lori - but i do love that award winner! Thanks for sharing all this eye candy. The new header is gorgeous and I love the chain maille piece. Lori, loved your show and tell! The bracelets are beautiful...I can appreciate all of the thought you put in to chosing the beautiful elements you chose. That charm bracelet is SO lush, oh my goodness it must have taken a very long time to create with all of those dangles!! I can just hear teh jingling now. "Larimar Pearl Princess". WHAT A BEAUTY!!!! Oh, gorgeous! I particularly love that first one; the colors are so beautiful. :) The holiday earrings are cute, too. Very lovely, all of them! Your pieces are fabulous! I just love all the bracelets. Can't believe it's time to start with the Christmas jewels. S T U N N I N G !!!!!! Wonderful items! The holiday earrings are so sweet.